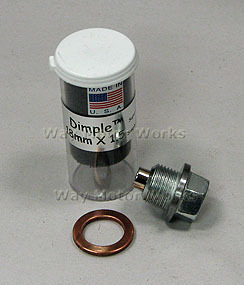 MINI Cooper Magnetic Drain or Fill plug for all MINI Manual transmission. The continuous wearing of moving parts in your vehicle's power train results in microscopic ferrous metal particles becoming trapped in the lubricating oil, which causes unnecessary damage to your engine, transmission, differential and/or trans-axle. This is a great addition while doing an oil change on your Transmission for some added insurance and piece of mind. Only for MINI Manual transmissions.